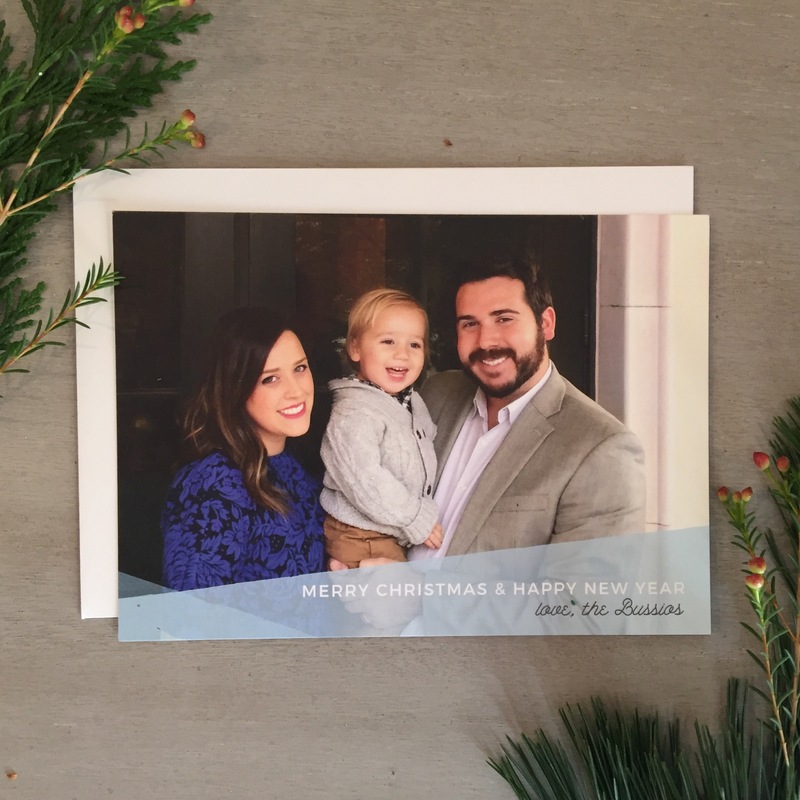 A simple Christmas card I designed for my little family this year. I used clean and crisp graphics for a contemporary feel. The reverse is an abstract geometric design representing a shining star. 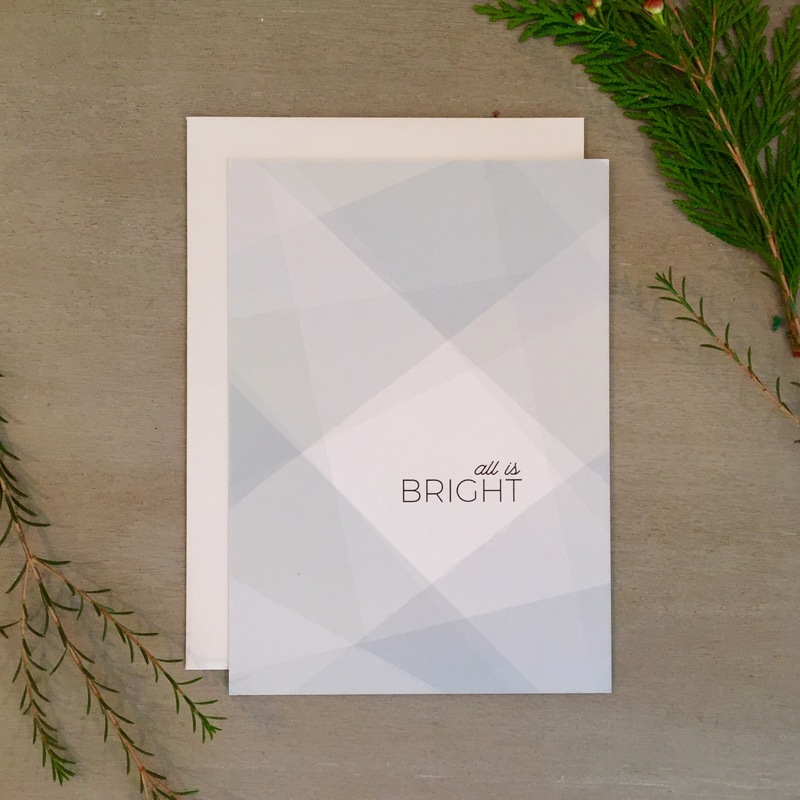 Printed on heavy paper with a smooth matte finish, the “all is bright” side of the card doubles as a cute little print that can be framed and displayed year after year. How to wrap and style Christmas Presents like a Pro. Wrapping Christmas presents really is one of my very favorite pre-christmas activities rituals. I cherish the time each year when I get to lock myself in a room alone with a beverage, some treats, and an ipad to binge watch shows on Netflix while wrapping gifts. I’m big on thoughtful presents and I believe presentation plays a big part in the way people perceive the time and love you put into their gift. 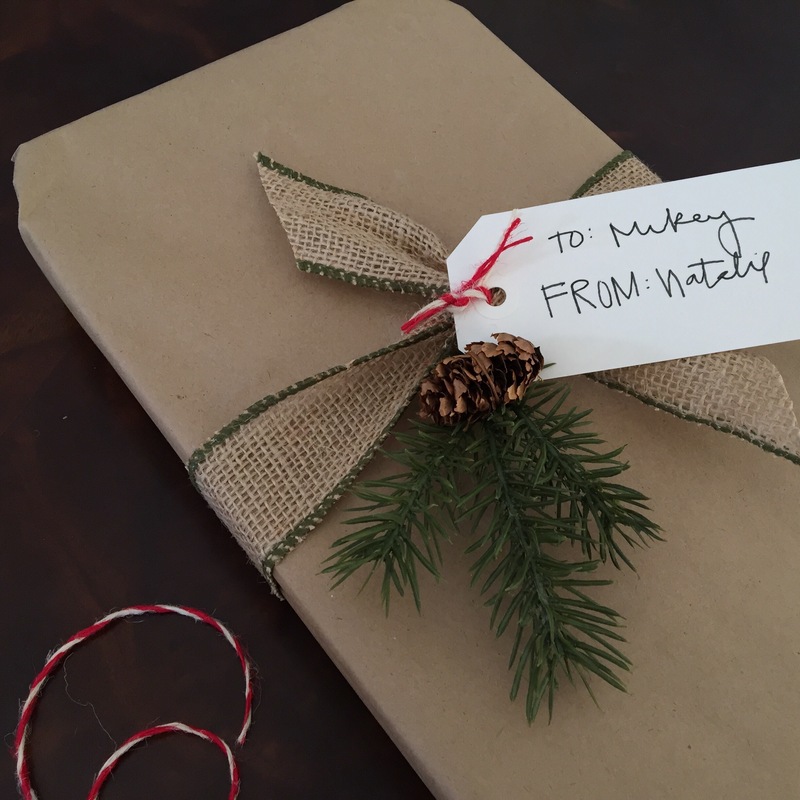 Here’s a few tips I’ve picked up over the years for how to make your gifts look like they were wrapped by a pro – even if you actually just ordered everything online right before the deadline for Amazon Prime 2 day shipping expired. Because of my graphic design training I tend to think of my Christmas design scheme as a branding campaign. This year I went for a rustic, traditional, natural style. Classic red and green on a backdrop of earthy brown and other neutrals. I love classic brown postal paper and use it every year. It’s a perfect neutral backdrop for whatever trimmings I decide to use. 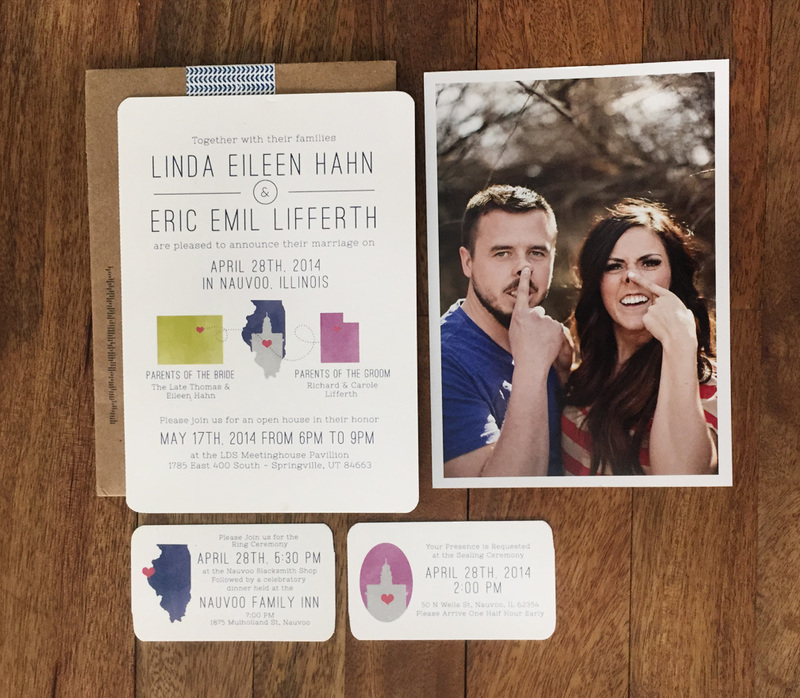 Solid white, cream, or metallic paper is a great choice and easy to coordinate as well. 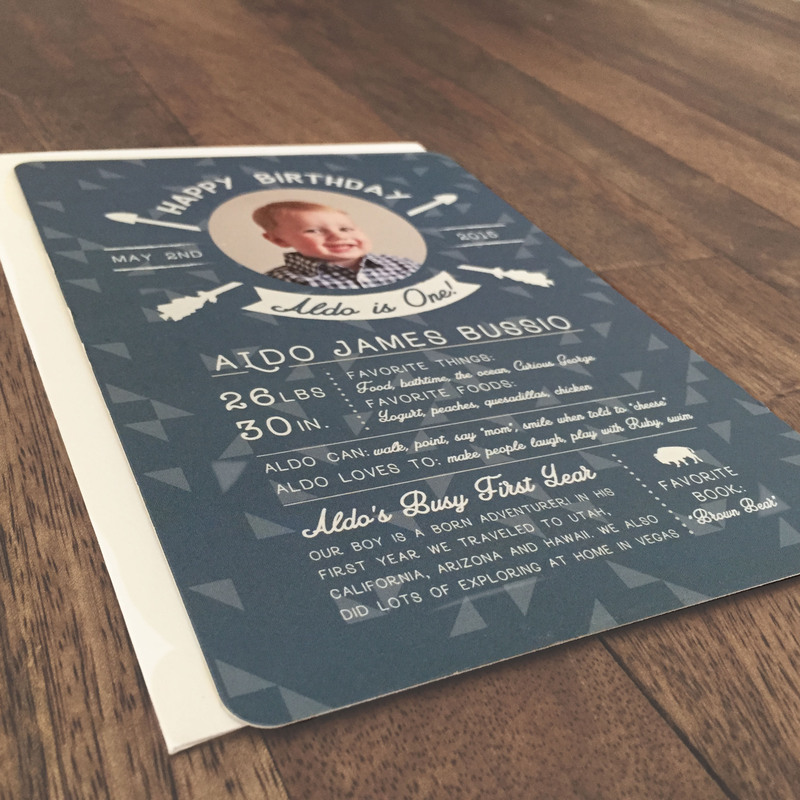 You can use patterned paper, but stick with something simple – stripes, polka dots or a tone on tone design. Pick four types of ribbon in a variety of widths. 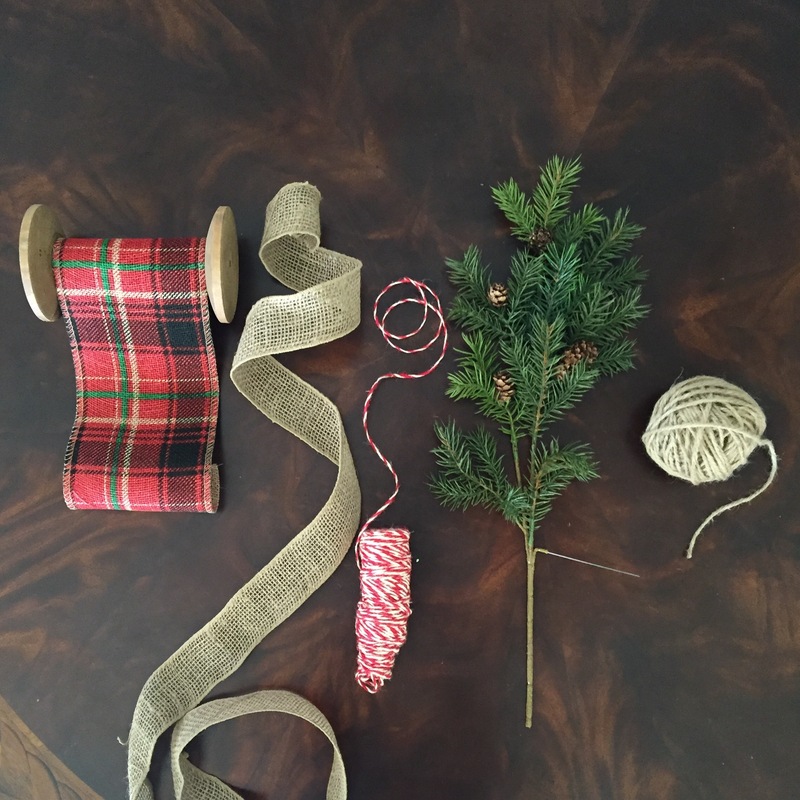 You’ll want a large (3″-4″), medium (1.5″- 2″) and 2 small (twine, yarn, ribbon or string .5″ or smaller.) Also get some tie-on items to add dimension. You can buy individual picks, chunky gift tags, or greenery at craft stores. I love using these sprigs of pine bough because they are only about a buck each when they go on sale and you can seperate the individual sprigs from the main bough. You end up with about 10 pieces from one pick. 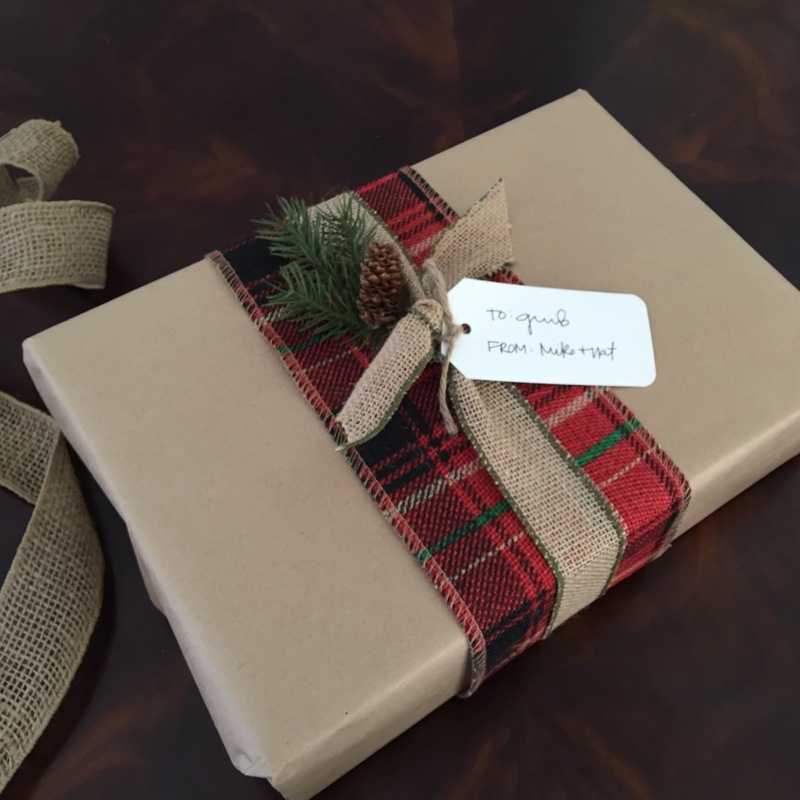 Whenever possible, put your gift in a box before wrapping. It makes it so much easier for you and it looks a hell of a lot nicer than some amorphous blob. Scale is really important in making your trim look great on your gift. 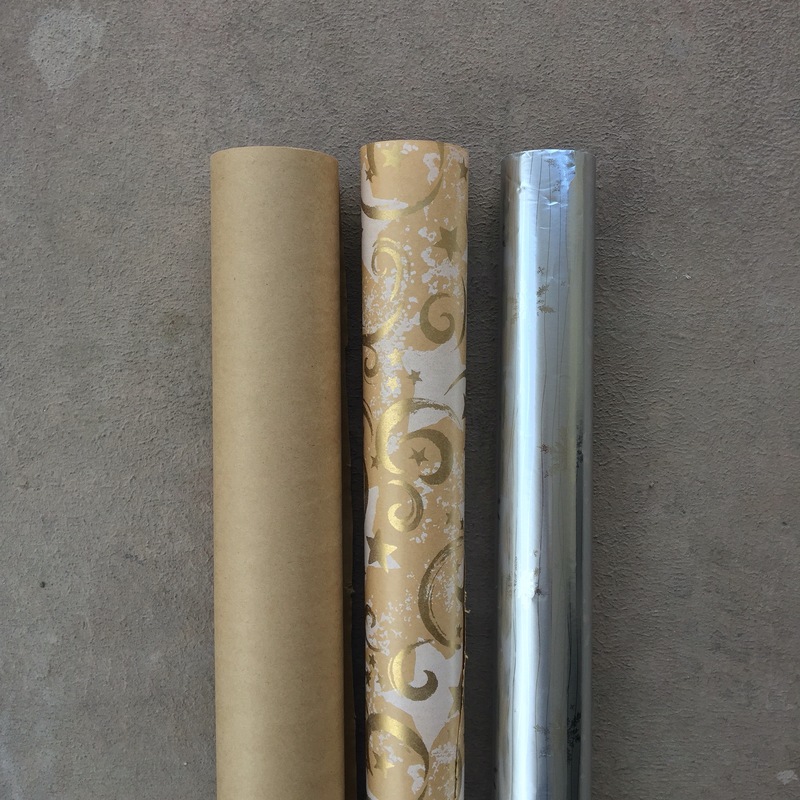 I find it’s easiet to pick three wrapping styles – one for small, medium, and large gifts and then stick with that same design for presents of similar sizes. For big gifts I used large ribbon to create a belly band and then layered the medium ribbon on top. Large ribbon would take over the packaging on a small gift so I stuck with thin twine, and a small pick. A good rule of thumb is to have 1/3 of the visual space of the gift ribbons and trim and the remaining 2/3 wrapping paper. 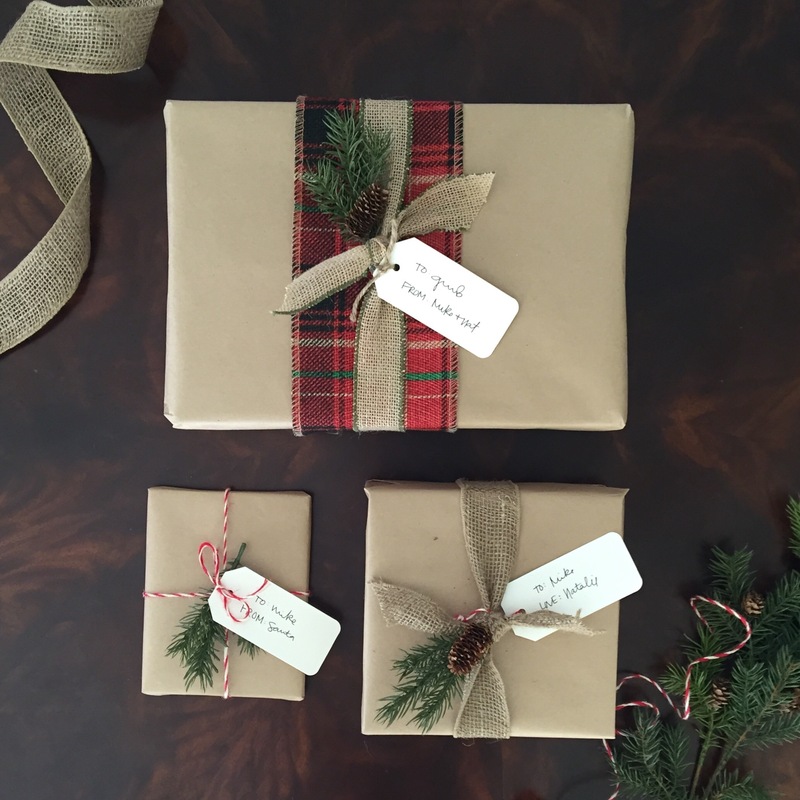 Try a few wrapping schemes – don’t be afraid to take the ribbon off and try again. Once you have your design for each size gift figured out your wrapping will go by a lot quicker than coming up with something new for each gift. 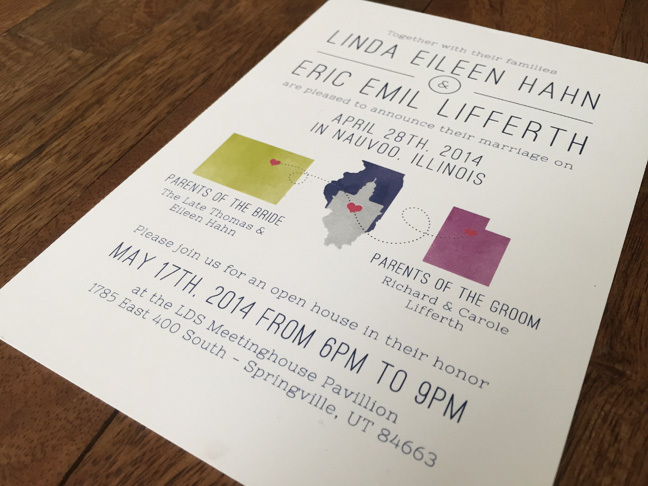 Today is my 5 year anniversary so I thought it would be fun to post a few details from my wedding. It had been a while since I looked through my photos and the first thing I noticed is how short the shelf life is on wedding trends. It’s only been five years but my pics (okay, and my hair) are looking a little dated. Freezing cold Utah December morning. From what I hear anyway. I was so pumped on adrenaline I didn’t feel a thing. An old gentlemen in the temple kept insisting I put on this faux fur capelet they had on hand to keep warm. I declined. Upon arrival at the reception guests wrote well wishes on vintage style postcards I created complete with old stamps and postmarks. Centerpieces were a collection of books, cameras, and globes. The flower arrangements were displayed in vases wrapped in old maps . And this is where we really spent the dollar bills – the food. A ginormous spread of authentic Italian antipasti and fresh Gelato. The real show stopper though, and honestly the only thing most people remember from our wedding, was the Dunford Doughnut’s wedding “cake”. Why have cake when you can have a delicious, moist, chocolate doughnut instead? No Brainer. Cheers to Five Years, Michael Bussio – The hardest working, bravest, kindest, and goofiest guy I know. I’m excited to share with you some of the projects I’ve been working on over the last year. 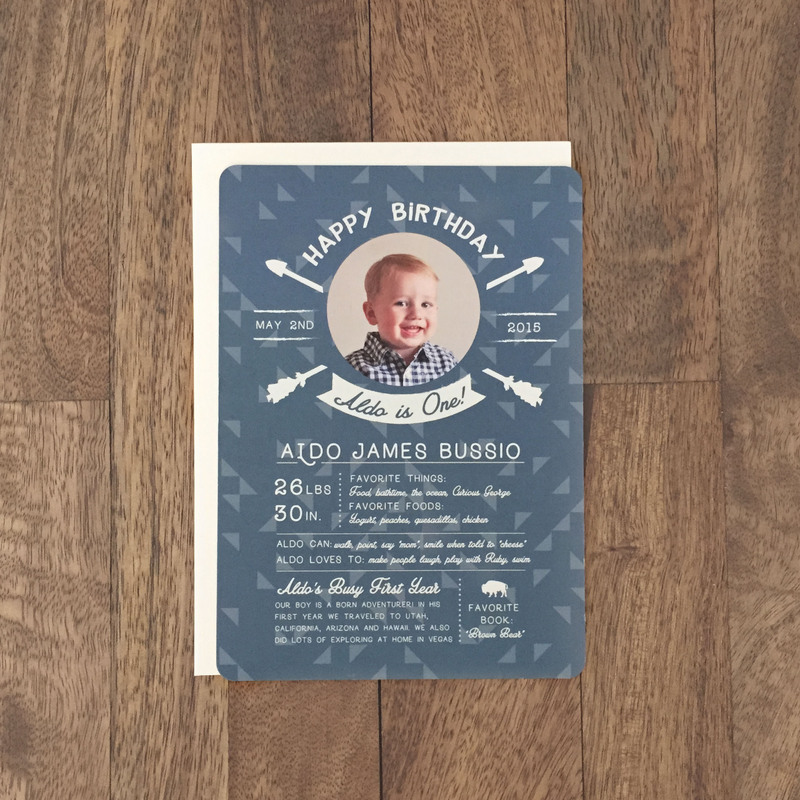 I’m especially excited to share this one with you because not only is this first birthday announcement pretty cute, It features my greatest creation of all time – my little Baby Man. 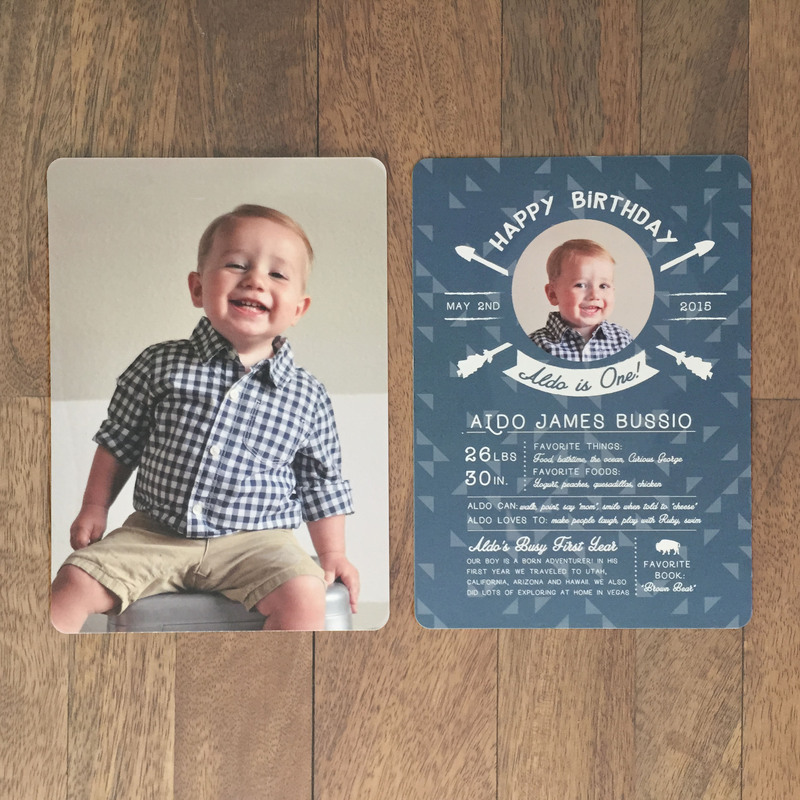 I created this first birthday announcement to send to all our family and friends who couldn’t be there to celebrate Aldo’s big day with us. 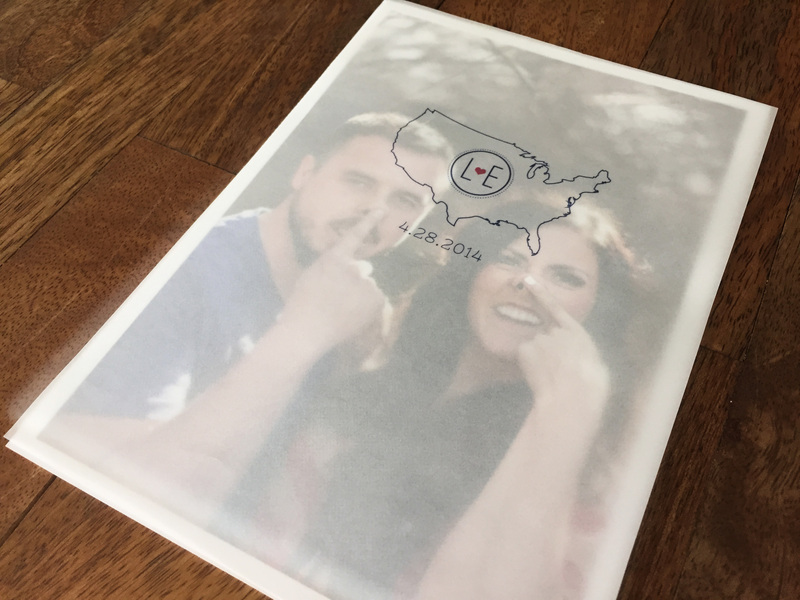 Facebook and Instagram (and all those other apps I’m too old for) are great for helping me feel my loved ones are a part of Aldo growing up, but nothing beats a real life memento showing up in the mailbox. Especially when it comes with a cheesy mug like this one. On making time to make things. It’s been over a year since I posted anything. I know. See, the plan was: 1. Have baby 2. Realistically struggle with trials of being a new parent 3. By month three baby sleeps through the night, and conveniently naps for greater than or equal to 3 hours a day. Time for blogging and business. Oh, and trade in stretchy pants for the cute pair of AG Stevie’s waiting in the closet. 4. HAVE IT ALL. So – in real life my baby turned out to be more of a cat napper and has only just started sleeping a 9 hour stretch at night. And stretchy pants are the best. Naturally, lack of sleep and lack of productive daylight hours led me to the decision to put the blog/business on the shelf indefinitely. I still worked on a few projects for clients and friends here and there, but I was always nervous about committing to new projects knowing my entire schedule now depended on a very demanding, very stubborn, very little person. But lately my heart has been longing to be creative again – in more ways than “how to entertain a toddler when it’s 107 degrees outside”. After a year of motherhood I still feel generally clueless, but one thing I have learned is you have to make time to make things happen. So here I am, rededicating myself to making things happen…by making things. 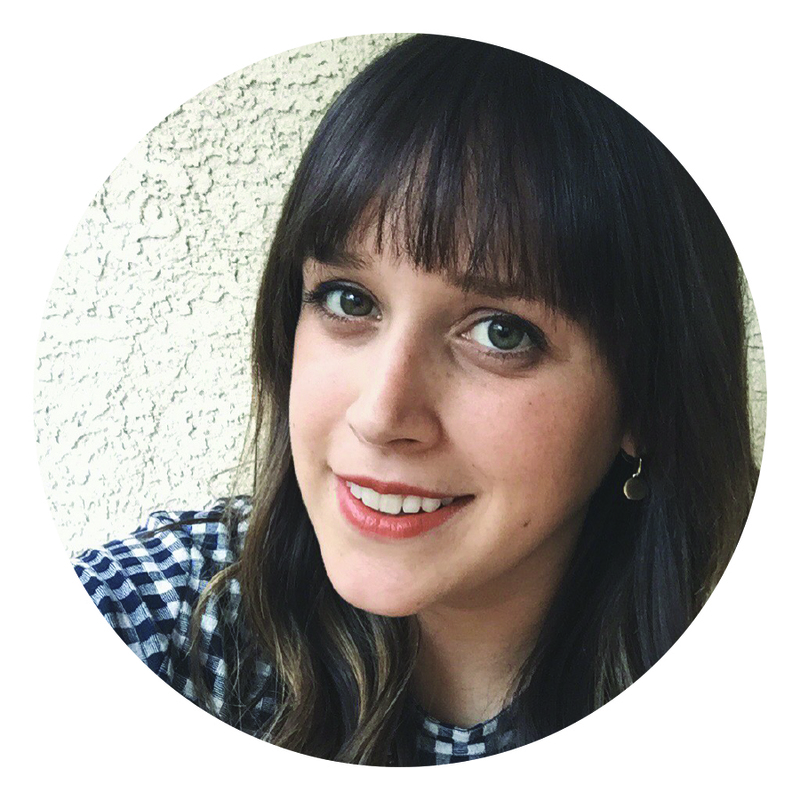 I considered taking a new direction with this blog – I mean those mommy bloggers always seem to have their act together, and I do have the requisite child…but lets be real. I can barely get my kid to wear pants – there’s no way I could make my life appear as fabulous and perpetually well lit as those mama blogging pros. 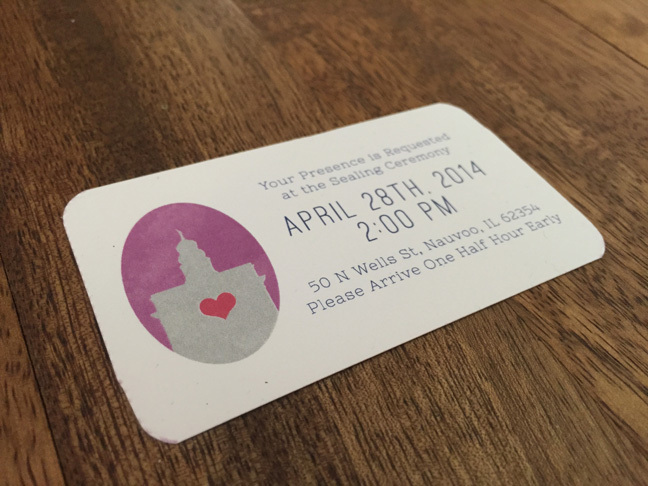 So I’m sticking to what I know and love – invitations, logos, and special details for special events. I’ll be documenting the projects I take on while sharing what inspires me. Oh, and I want to talk more about my enchanting desert home. Las Vegas, I love you. I’m right where I belong. West is best. This being baby number one I’ve experienced all sorts of weird things for the first time. First genuine give-it-to-me-now-or-I-might-die craving (Strawberry Pop Tarts). First stranger at the grocery store giving me horrible, unsolicited, misinformed medical advice. First time turning to my side to walk between two parked cars and realizing I’m just as wide turned this direction and shall not pass. It’s like every day is just bursting with exciting, totally off-putting surprises. 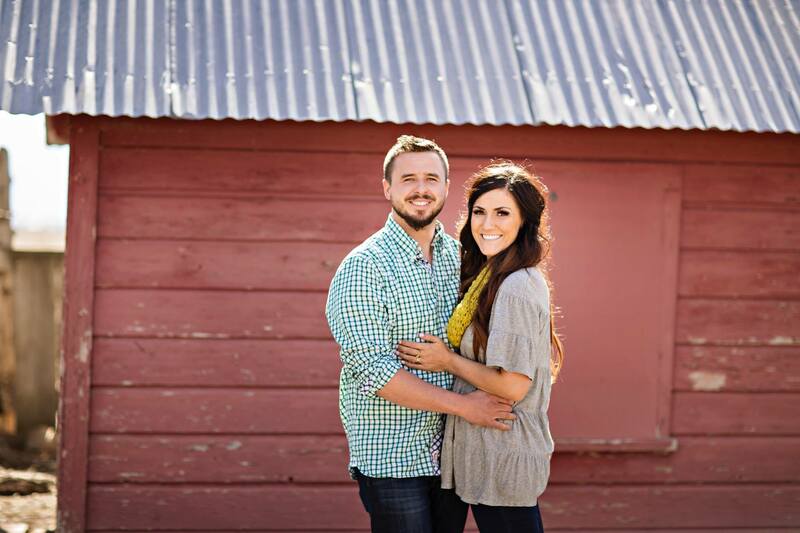 Of course there are good “firsts” too like hearing my little guy hiccup during a sonogram. It’s taken me a few months, but I’ve finally gathered enough twigs, leaves, and fibers to create a comfy nest for this little baby and I want to share what I’ve come up with. I wanted a rustic, masculine feel while still clean and soft. I chose a neutral palette of gray, dark brown, and cream and accented it with a little navy blue and a mustard yellow. 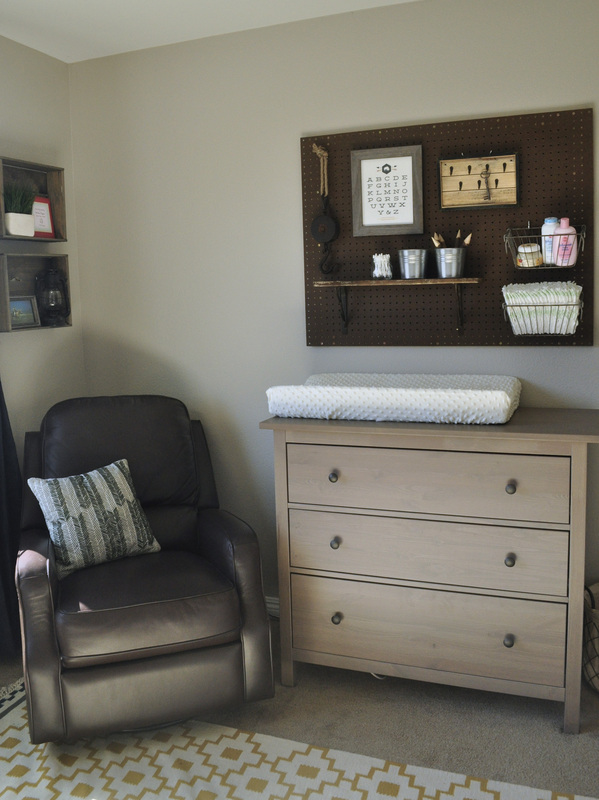 The gorgeous wall color is “Sharkey Gray” by Martha Stewart – it’s very mellow but warm which helped it match beautifully with the brown elements in the room. We painted the entire room gray and then came back and painted white horizontal stripes on one of the walls after it was dry. I really wanted a cool, western (NOT country) piece of art to hang above the crib. 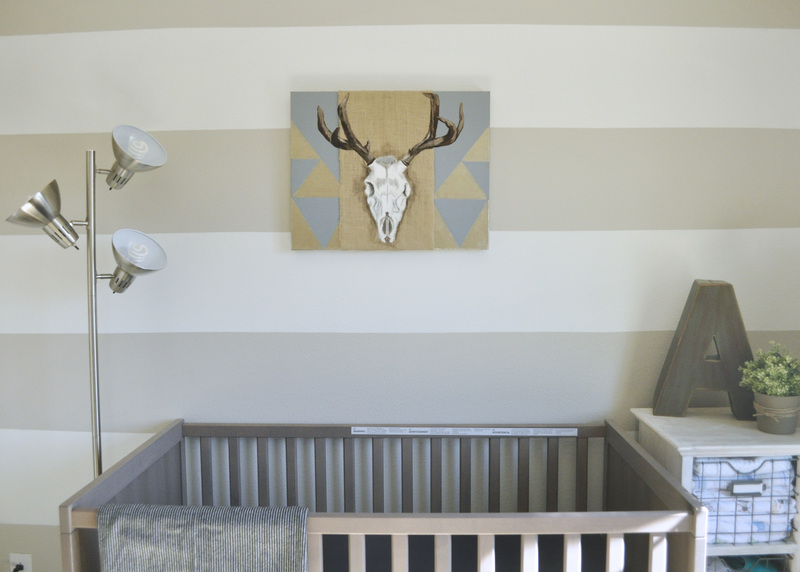 I loved the idea of a skull or antlers, even though some of my friends thought that sounded pretty creepy for a baby’s room. I looked all over but couldn’t find the perfect piece. I was completely blown away when my extremely talented friend Harmony Rodriguez surprised me with this painting as a baby shower gift. I think it’s just perfect. 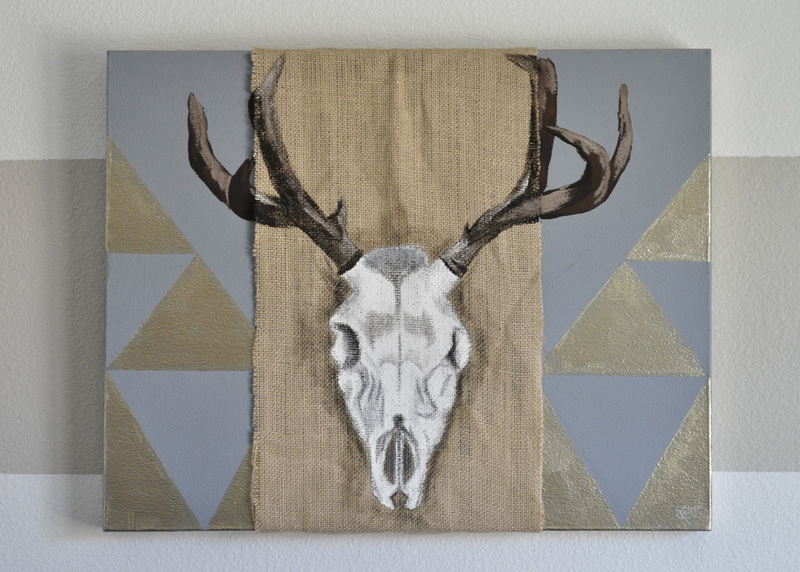 Most of the skull image is actually painted on a piece of burlap which wraps around the canvas. Such a creative idea. 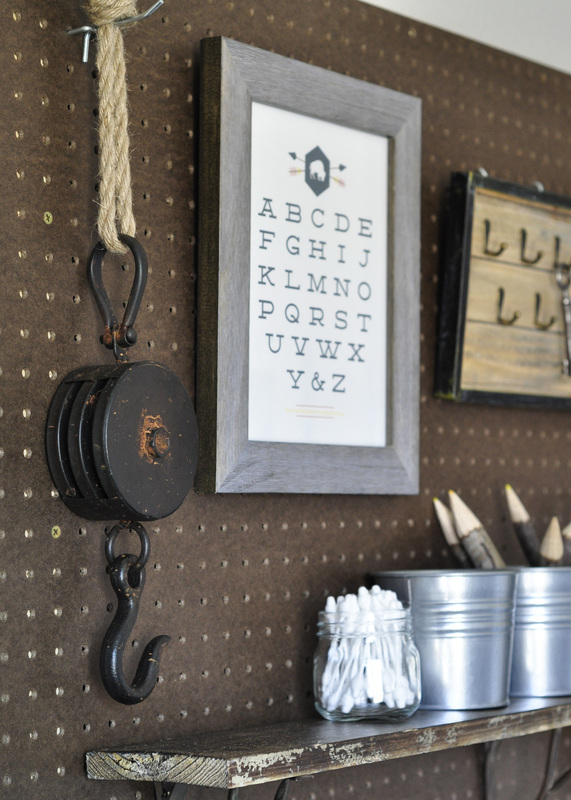 The burlap along with the metallic paint add so much dimension to the piece. 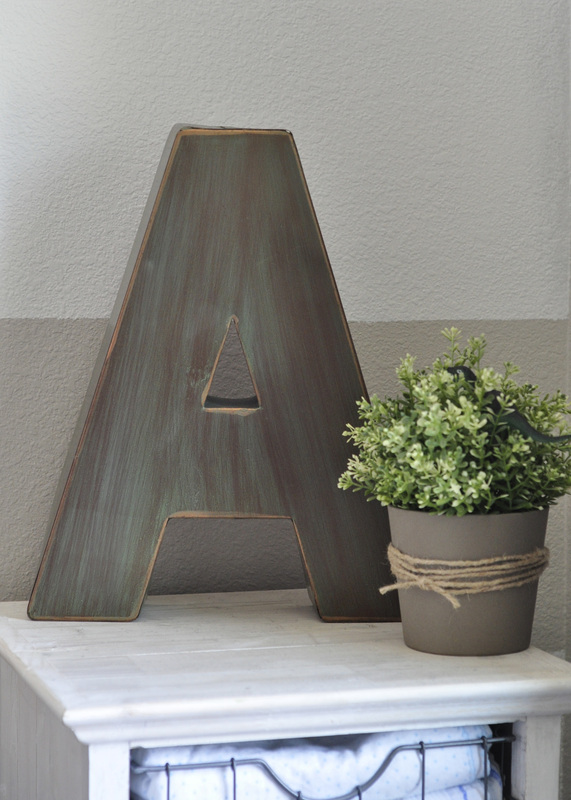 I love the color and texture of this large metal letter – I guess I’ve committed to giving him that “A” name now. 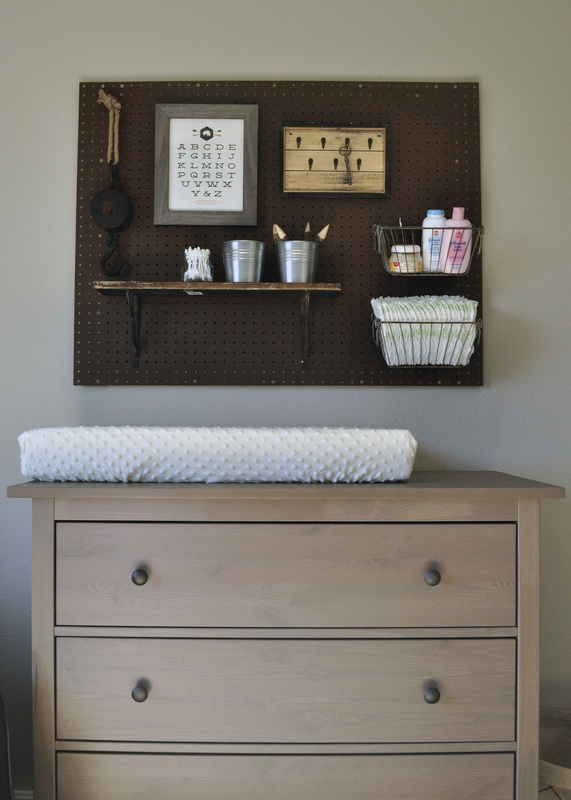 My big project for the room was building this pegboard to hang over the dresser. 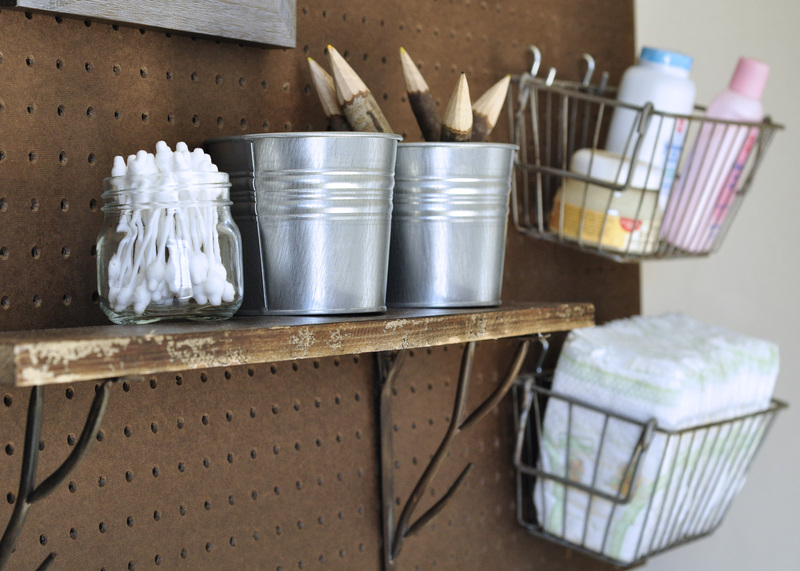 After finding the perfect metal baskets to fill with diapers, lotion, etc. I filled in the rest of the space with various decorative items. 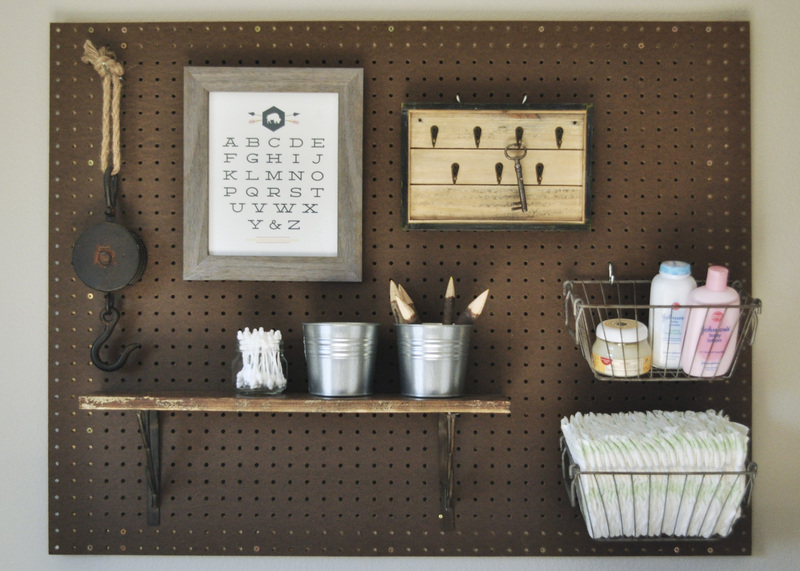 Right now the pegboard it’s definitely more form than function, but as the little guy grows I’m sure it will become a handy storage and organization tool. 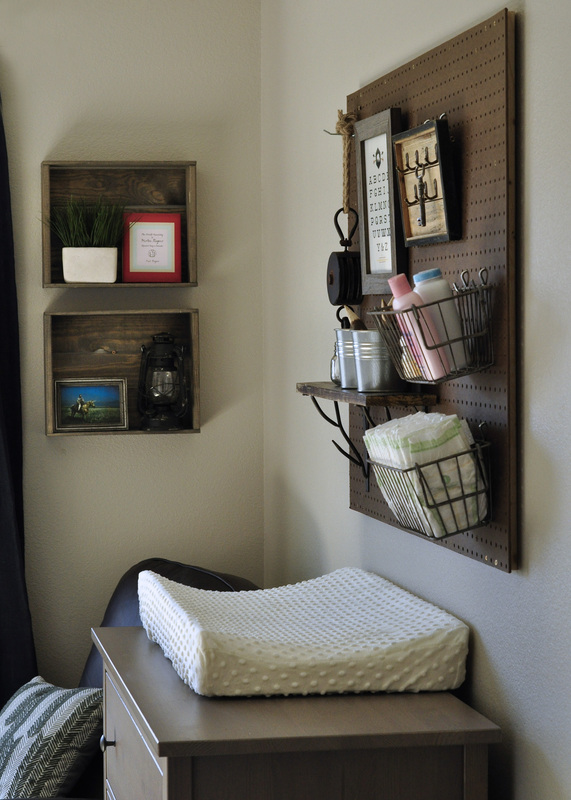 A pair of barn wood crates hung on the wall make for a great place to display books and photographs. Mike was heart broken when we discovered that his beloved, extremely comfortable “Grandpa Chair” didn’t fit in our living room. I hope he feels a little better knowing that it’s found a good home in his son’s room. 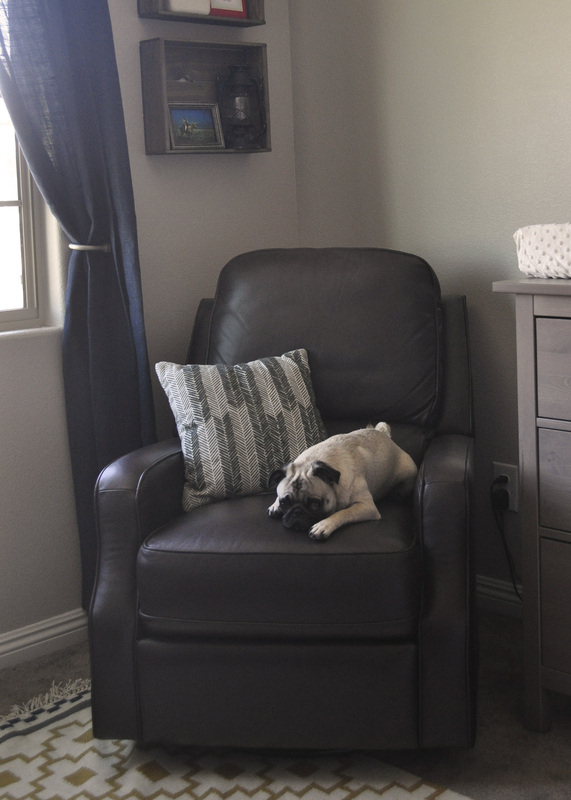 It will be a lovely place to sit and rock the baby – if I can ever get Ruby to give it up.